Borrowing from Discovery.com’s 2012 top ten list of natural building materials, here are ten earth-friendly building materials, some old and some new. Locally sourced rock is the most earth-friendly, due to short transportation distances. Extraction may be the most energy intense part of the life cycle of this material. Rocks can be mortared together with earthen plasters such as sand and clay or lime. Rock walls have very good thermal mass, which means that they absorb the outside temperature, hold it in and then radiate it throughout the building. Straw bales can act as the actual structural building block or as the fill for insulation in a traditional post-and-beam structure, where the frame supports the home, as opposed to the straw bale. After the bales are stacked, the walls are plastered. The thick walls provide excellent insulation and are about 75 percent more energy efficient than conventional homes. ­Bamboo is a renewable resource because it’s one of the fastest growing plants. It has a shorter growing cycle than timber, and harvesting bamboo does not affect the roots of the plant. It is most commonly used as flooring, millwork, or cabinet veneers. It is also being used as a structural element in micro-housing and other building developments. Cordwood building uses wood cut into small sections, such as for firewood. Scrap from lumber yards or harvested from fallen trees can easily be used in this type of construction. The wood is laid so the width of the wall is determined by the length of the pieces, and a mortar is applied. 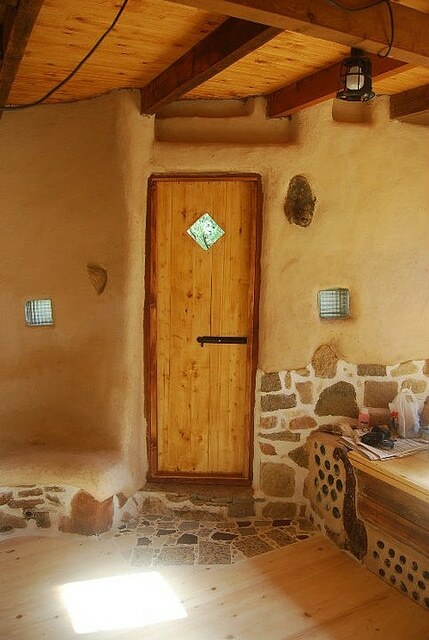 The cordwood and the mortar provide thermal mass and insulation. To use rammed earth, a mixture of soils is packed down into a temporary wall form that shapes the mixture. The form is usually wooden, and it must be strong enough to withstand the compression of the ramming. Ramming can either be done by hand or by machine, and once it’s completed, the forms can be removed, leaving an earthen wall. Based on the same principal as sandbags used to hold back flood waters, earthbags are filled with dirt from the area and stacked in a brick-like pattern. Structural tests have shown earthbags are seismically sound and can withstand the elements. Buildings can range from simple hut-like structures to those resembling homes found in fairy tales. Earthships, created by Michael Reynolds, consist of earth-filled rubber tires that are stacked like bricks. Interior walls are constructed out of aluminum cans. Because these types of buildings are made from materials that would have gone to the landfill, they can actually make the earth greener by repurposing waste materials. Those familiar with “The Hobbit” will recognize these underground dwellings. They can also be built above ground, with the sides of the home or the roof covered with earth. Underground earth-shelters aren’t completely dark; windows and openings provide heat and natural light. One of the oldest building materials around, adobe is made by pouring a mix of clay, sand, water and sometimes straw into a form, most commonly a brick. Once the bricks are dried, usually in the sun, they are stacked like bricks with mud mortar. Photos courtesy of: fdecomite, Forgemind ArchiMedia, Kane Jamison, and Selva Manfredini through a Creative Commons License. has over 15 years experience in the construction industry and is the author of Green Building Design 101, an e-book available from Amazon. She is a LEED AP and Certified Green Building Advisor, and has worked on the LEED Certification of three projects in Salem, Oregon.